We couldn't be happier to be writing this post! Our beautiful, precious daughter has finally arrived, and we are so grateful and in love. Born June 16th, 2018 at 8:07am, weighing 6lbs. 15oz. and measuring 20.5" long. I can’t tell this story without praising Jesus over and over! He was so mindful of me and answered my prayers above and beyond what I had hoped. We serve a loving, kind, powerful God. From week 36 on, I had noticed that I wasn’t growing as much as I thought I would. My midwife appointments confirmed that, though they assured me that it’s normal to level off towards the end of pregnancy. I had expected to feel quite miserable as I neared the end of the pregnancy, but I instead felt pretty stable! As if I could be pregnant forever. I was discouraged at times, but I was mostly very grateful that I could still sleep, bump the volleyball with Jon, walk, and enjoy the pool. The day before I turned 41 weeks, I had an ultrasound and midwife appointment in the morning. As I was getting ready and making my omelet breakfast (super proud of myself – I had an omelet for breakfast every morning since February 1st! ), my stomach began to churn. I realized that deep down, I was actually very nervous for this appointment. I didn’t have a vision for going into labor. It was more than just not experiencing it before and not knowing what to expect. It was a gut feeling that I’d have to be induced. 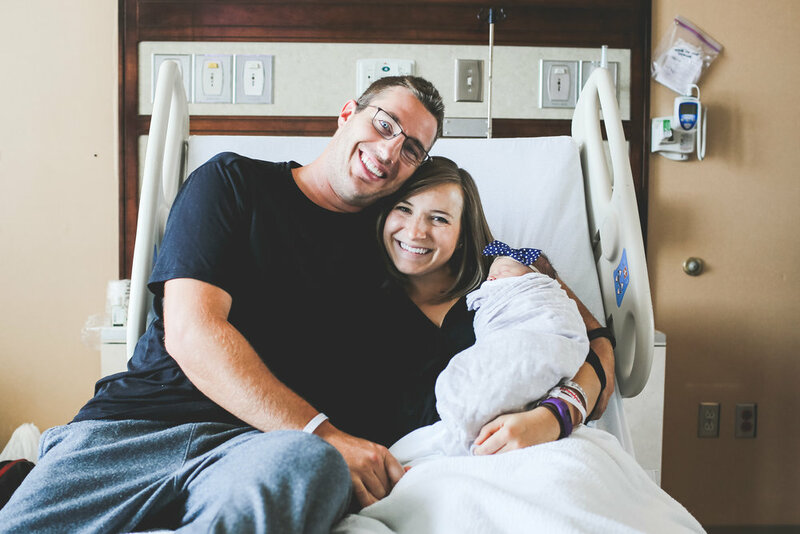 I was scared that something was wrong with our precious girl, and that I’d have to rush to the hospital. When I arrived to my appointment, my mom was already waiting for me in the parking lot. I’m so glad she came to the appointment! Thankfully, they took me just moments later. Praise! The technician measured everything that was important, then gave me permission to go to the bathroom. When I returned, she said that she needed to finish measuring the baby. After finishing the second round and cleaning up the goop on my belly, she decided that she need to (once again) measure the head since it was measuring small, and she needed an average to go by. I was nervous hearing this, though doing my best to trust Jesus through it. 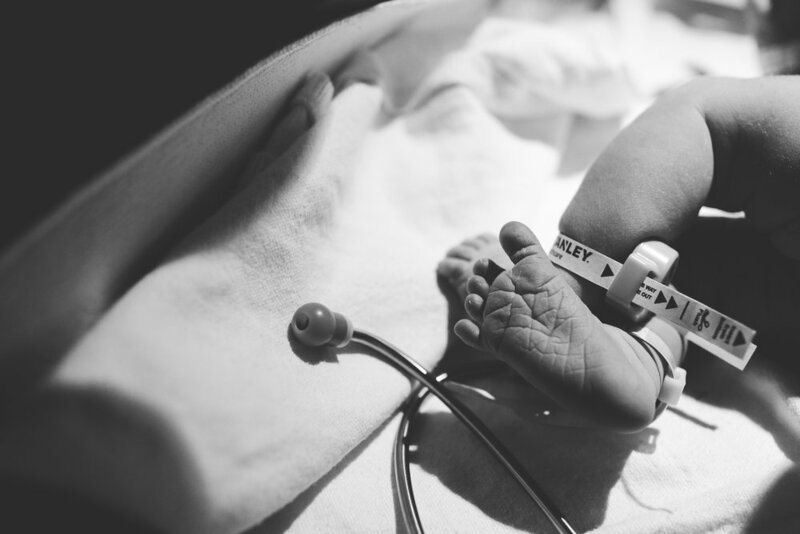 “The midwife will explain it all to you,” she said. My mom reminded me that she’s just the technician, and she isn’t allowed to share results. The midwife will explain it all to me. After moving rooms, I waited a LONG time for my midwife, Erica, to come in. It was probably a 15-25 minute wait, which seems terrifyingly long when you want to hear what’s going on with your baby. There are 6 midwives in this office, and I had met 3 of them so far. I have loved all of the ladies and couldn’t recommend them enough! Erica is newly married, young, and very sweet. I’ve always enjoyed seeing her at my appointments. When she entered the room, she was calm and to the point. She explained to me that London was measuring small, in the 9th percentile, and my fluid was just barely passable. Usually, they would allow me to go the full 42 weeks before inducing, but they had some concerns for our baby. The concern was that there was something wrong with the placenta, and London wasn’t getting everything she needed. On the flip side, it could be that Jon and I make small babies, and there was nothing to worry about! But if we waited it out with a dying placenta, then we’d run the risk of the placenta completely dying before she was born (resulting in a still birth). Erica told me to call my husband, eat lunch, grab my hospital bag, and head to the hospital to be induced. I asked her several times if there was anything wrong with London. I was so scared that she’d have brain damage. Erica assured me that there was nothing wrong with London, and that the ultrasound measurements looked great. Inducing was preventative, to avoid a worse case scenario. I was so grateful that she didn’t think anything was wrong with our baby! During the appointment, I could hear my phone vibrating in my purse that was sitting on the chair across the room. I figured it was Jon wanting to see how the appointment went. Poor guy, the long delay in reply made him nervous. After leaving the office, I called Jon to tell him we needed to head home to get ready to have this baby! I was emotional and shaking a little bit. This was about to happen, and I was nervous and excited! We finished packing our bags and I did a quick clean of the house before we left for Costco to get gas and lunch. After eating a pizza, we headed to the hospital! 12:30pm – We arrived to the hospital. I was having lots of Braxton Hicks contractions that were quite uncomfortable – most likely from being stressed. They parked our car for us and brought a wheelchair for me. The lady at the front desk quickly got me to the front to check in. I hesitated, wondering if I should just say YES. I mean, I was having lots of contractions that made it hard to walk, and I was there to have a baby. The sooner I could get in, the better! 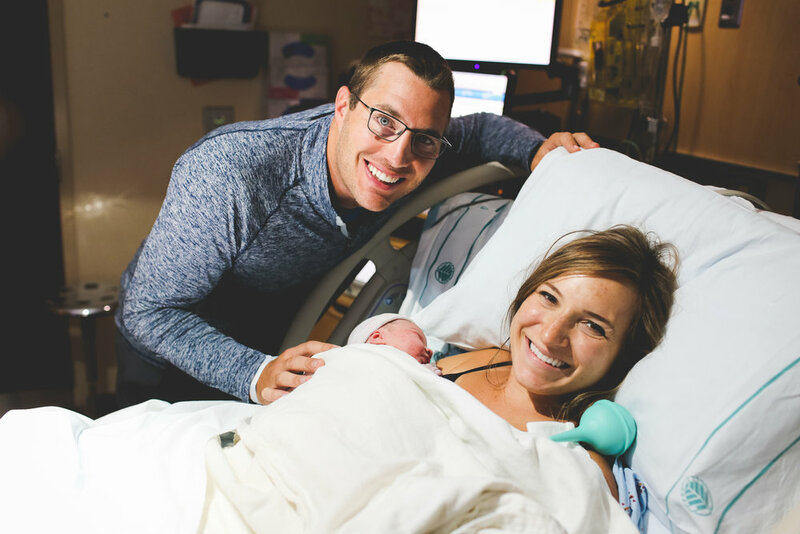 1:15pm – After changing into the attractive hospital gown and being asked a load of questions, I was brought into the labor and delivery room. This was the first time I had ever been in a hospital for myself. I had always expected to be in tremendous pain when I went to the hospital, so this was nerve wracking for me – I was going to get stuck with needles and hooked up to monitors before the pain even begun. My first nurse was Wanda. She was very nice, but scared the life out of me right before sticking me with the IV. “WHAT?!? !” I pulled my hand away from her as fast as I could. Shouldn’t it just feel like a normal needle??? I needed a minute to prepare for this. Jon held my left hand while she did the IV on my right wrist. I don’t know what she was talking about. It didn’t hurt like she had described. Apparently she just wanted to set expectations so that it wouldn’t be as bad as I thought it would be. I just wouldn’t recommend scaring your patient like that. However, she wasn’t quite as gentle as I would’ve liked for her to be. The needle was wiggling back and forth as she was getting blood samples and who knows what else (ain’t no way I’m looking!). It was pretty painful and sore almost the entire time I had it in my wrist. So the IV was on my right wrist, the blood pressure monitor was on my left bicep, and I had two monitors around my belly (one to measure contractions, and the other for London’s heart beat). Oh, and not to mention a gown that was WAY too big for me. I felt like I couldn’t move, and going to the bathroom was such a pain, especially with the IV hookup in my dominant hand. The midwife was delivering other babies, so we had to wait for her to finish. While we waited, we turned on the tv and selected a movie to watch: Jumanji. I hadn’t seen it, and I needed something light hearted! It. Was. Hilarious. I laughed so hard. And thank goodness I watched the movie before I had London since laughing was a no-no during recovery - because stitches. (note: I wouldn't recommend this movie for kids because it has lots of adult humor in it). I was super hungry and was told that I couldn’t eat until the morning before they gave me Pitocin. Like what. I’m pregnant. And I’m hungry. Since it was taking a while for the midwife to come, the nurse told me I could eat some snacks. Yay! 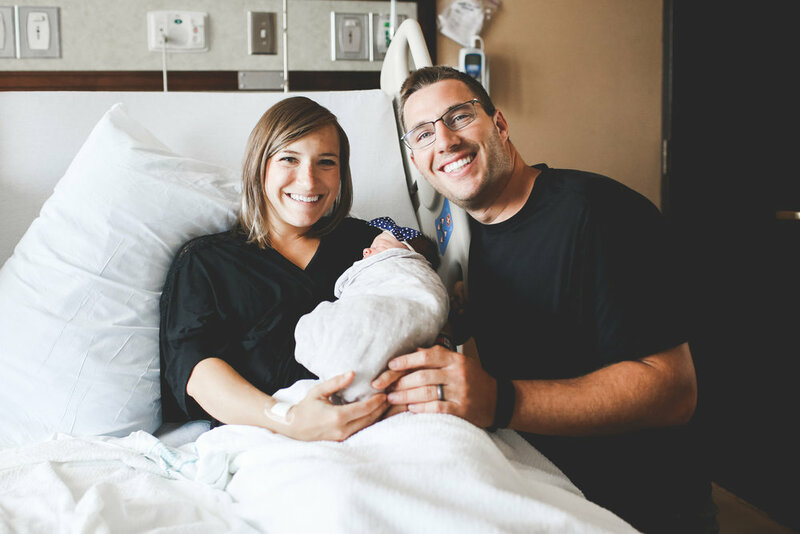 3:30pm – the midwife finally came in to see me, and I was glad to get the ball finally rolling! The midwife on call was Kathy, one of the midwives I hadn’t met. But she was wonderful, and I trusted her immediately. Kathy described two methods of induction for me to choose between. One was more natural, but was a mechanic that doesn’t actually put you into labor (it just progresses the dilation). The other method was a pill (Cytotec) that would cause labor to start. We all agreed the pill was the best option for me. Though I wasn’t too keen on using medication/drugs, the other option was a literal nightmare to me.. The midwife and nurses all told me that it could take 2-4 days before I could even have the baby. Induction can take a very long time, and they wanted me to have realistic expectations so that I didn’t get discouraged. I received the first pill at 4pm, and could get a second pill at 7pm. The most I could receive would be 4 pills during a 12 hour period. Thankfully, I only needed one pill, and it basically put me into labor. PRAISE THE LORD! My nurse for the rest of the time until 7am was Kristin. She was fantastic, and I so enjoyed her company whenever she came in. 6pm – My sister, Lauren, and niece, Athena, came to visit us in the hospital! When I felt scared or overwhelmed by what lay ahead, I’d scroll through photos on my phone of Athena. She’s such a precious little girl, and I love her so much! Seeing her photos reminded me that we were likewise about to have a baby, and whatever I’d endure would be worth it. I watched it as long as I could, until I moaned too loud and just wanted quiet. 9pm – My mom arrived to spend some time with us! I honestly don’t remember much from here on since I was in more pain, though nothing quite unbearable yet. 11pm – I finally got some pain reliever meds. I didn’t want to take meds so early, but my nurse, mom, and Jon all recommended that I get some rest. The contractions were getting close together and very painful. The nurse, Kristin, told me to go to the bathroom before getting the pain meds because it would most likely make me dizzy. Within seconds of getting the meds, I felt dizzy and tired. I couldn’t believe how fast it worked! I lay on my side with my eyes closed and just rested. The meds made my breathing feel weird – I’d take a deep breath, and then it’d take too long for me to take another breath. It would wake me up because I’d get nervous that I wasn’t breathing. I felt like this the entire labor, so I never quite slept, just rested. Jon went to the cafeteria with a $5 voucher to get a chicken sandwich and fruit for me to eat. I was so grateful to eat something! He fed it to me since I had my eyes closed due to the dizziness. Mom left a little after this point, and I don’t remember much besides resting through contractions. 12:30am – I believe this is close to the time when I needed another dose of the pain meds. Kristin told me that it only lasts for an hour, and I had waited an hour and a half before asking for more. She gave it to me through the IV, but after waiting for it to take effect, I realized that it wasn’t working. In response to my moans that continued to escalate, Jon called nurse Kristin back in to see if there was anything else I could have for the pain. The contractions were still around my lower belly and back, squeezing the life out of me. It got to the point where I didn’t quite know how to deal with the pain. I now see how women go insane and even vomit during labor. “Yeah, I didn’t think that was going to work,” said Kristin concerning the last dose of pain meds she gave me. Apparently, I was progressing so fast that the meds weren’t strong enough anymore. Though I had my eyes closed, I was listening to Jon and Kristin talk about next steps. And that’s when I heard it. She finally said the word. “I think she’s ready for the epidural now, let’s start getting everything prepped.” I was so shocked and didn’t quite believe I was far enough along to get it. “But I’m not in active labor yet!” Kristin explained to me that I was close to active labor and I was progressing all on my own without the help of Cytotec. In fact, I only had that one dose of the pill – it basically put my body in labor and I didn’t need any more help! The plan was to get the epidural, and then get Pitocin. “You do NOT want to have Pitocin before you get the epidural. If you got Pitocin first, you probably wouldn’t be able to get the epidural – it’d be too late.” GOT IT. Epidural first! 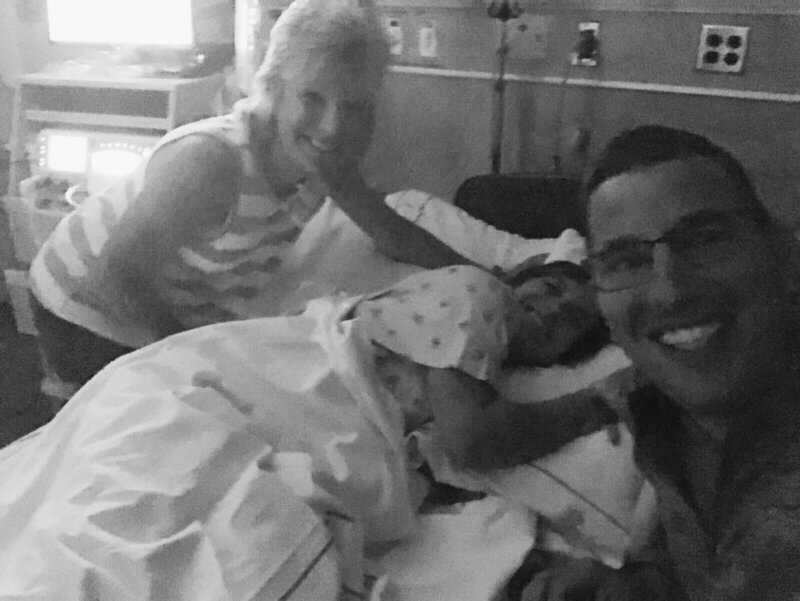 2am – A doctor came in to give me the epidural. He was so calm and gentle, I trusted him immediately, like I had done for my midwife. It certainly helped that all of the nurses said that he was the BEST in the hospital. Thank you, Jesus! As they prepared me for the epidural, I started to get really nervous. I didn’t want to see a thing or know what he was doing. This is the part that scared me the most! My contractions were coming so close together and were so strong that I was scared that I wouldn’t be able to sit still long enough for him to do the needle (which is apparently as thick and long as a McDonald’s straw. Ok, maybe not that big, but I wouldn’t know). Instead of my contractions giving me a break in between, they would lesson to about 40% before escalating again. I just couldn’t get a break. Oh, and the contractions continued to feel very much like a painful period. The pain was oddly very familiar to me. Yeah right. That’s what the eye doctor says when they say to keep your eyes open but that contraption thing is actually touching your eyeball. But this time, I welcomed it. I didn’t want to feel, see, or know anything. A couple seconds later, not even a minute, he says that he’s all done. AMAZING. I didn’t even feel him put pressure on my back or anything. Seconds later, I began to feel the effects of the blessed epidural. My legs started to tingle and feel heavy. I always thought that the epidural would make me completely numb from the mid belly down. But that’s not the case at all. I could still feel some of my legs and my feet. 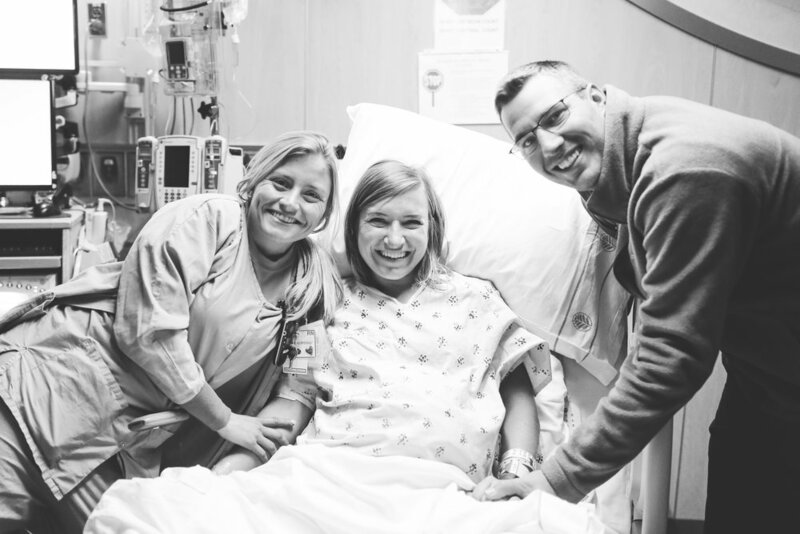 Every hour or so, Kristin would come in to check on the epidural. I’d move my feet and toes and she’d check to make sure I still had feeling in my arm, mid-upper belly, and legs. I didn’t find out until later that I never did receive Pitocin. All my body needed to go into labor was one tiny pill of Cytotec. 3:15am – 8cm! Everything started to move REALLY fast once I got the epidural! It was amazing to be able to rest. I still didn't sleep because of my breathing, but resting definitely felt wonderful. Somewhere around this time, Kristin wanted me to change sides. She helped me move from my left side to my right side. However, London’s heart rate plummeted from a steady 149 to a scary 97. I knew something wasn’t right, but also realized that maybe she just needed to get repositioned inside of me. Though she kept her cool, I think Kristin must’ve pressed a panic button because several nurses came rushing in. Kristin helped to move me back to my left side or my back (I can’t remember). The heart rate began to rise back to where it originally was. The nurses checked to make sure all was good, and that’s when I heard one of them say, “Oh, well, there it goes!” “Did my water just break?” “Yes, it did!” It sounded like she did it by accident. They gave me an oxygen mask at this point. “Giving your baby oxygen is the most important thing you can do for her right now,” Kristin told me. I diligently took deep breaths through the mask, ensuring that we both were receiving the oxygen we needed. 5:30am – 10cm! At this time, Kristin had me sit up straight to help with laboring down and getting London lower. “Do I need to bounce or sway? ?” “No, just sit there!” I couldn’t believe it was that easy! Sitting up straight also helped to reduce tearing and the amount of time I’d have to push. I was all for that! I sat up straight in my bed for 2 hours before I began pushing. So easy! I started to feel some back pain again, and I mentioned it to Kristin. She told me that I definitely would want some more epidural because once I started to push, I for sure wouldn’t want to feel anything. There was a button on my IV that I could press to give myself a little more of the epidural. I pushed it twice (not at the same time) before the pain was gone. Glad I got that taken care of! 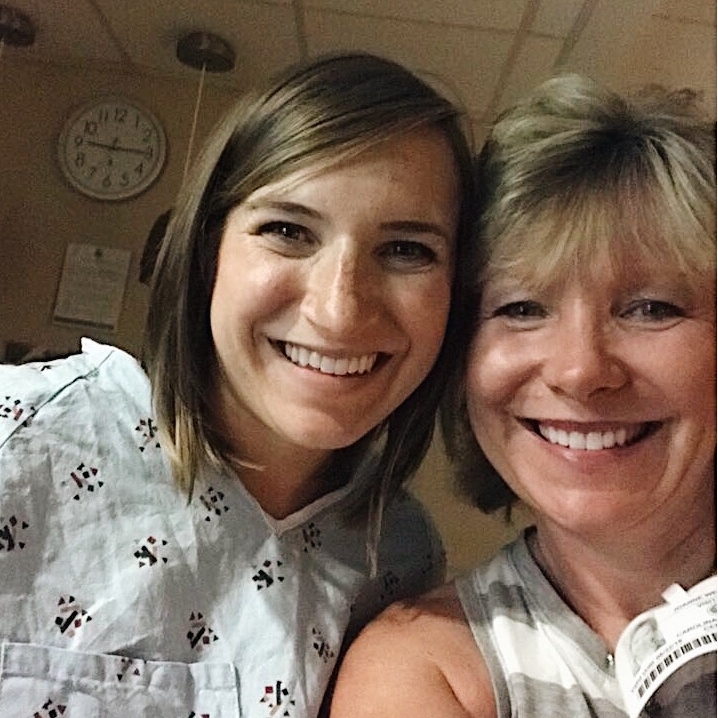 7am – Sadly, Kristin’s shift ended, and she introduced me to my new nurse, Colleen. 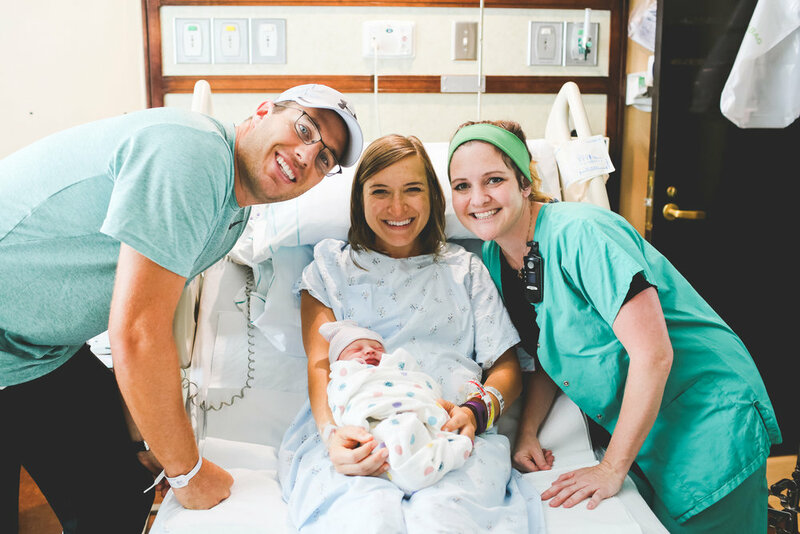 I was hoping that Kristin would be there to deliver London – she just barely missed her! Thankfully, Colleen was wonderful, and I really liked her! 7:20am – Kathy, the midwife, came in and got everything prepped to have the baby! It was surreal. Was this really about to happen?! They had me do a few practice pushes before we really got things started. For some reason, this isn’t how I had imaged birth. This was WAY too easy and calm! And completely pain free! But I wasn’t going to complain! 7:40am – PUSHING BEGAN!!! I was pushing hard, but not quite hard enough. I asked them, “Am I supposed to be pushing as hard as I absolutely can?” “YES! !” So I did. They said to push as if you’re having a bowel movement. Instead, I pushed as if I was doing an intense ab workout, P90X style! I looked at my belly the entire time and engaged those muscles, watching them contract the harder I pushed. Through 8 contractions, I pushed – 3 sets of pushes per contraction that were all 10 seconds long. They told me they could see her head! I asked if she had hair, and they said YES! They had asked if I wanted a mirror to see her being born, but I declined. As neat as it’d be to see her come into this world, I was nervous that I might get grossed out and lightheaded! Maybe next time. As her head was starting to come out, Kathy asked if I wanted to feel it. I hesitated, but figured I probably should feel her. I was scared to reach down there, so I asked them to guide my hand. As I reached down, I felt something incredibly squishy and slimy. I jerked my hand back and made a noise of disgust (because WHAT WAS THAT). They all laughed and said that I had actually put my fingers into the shampoo they had on her head as they were cleaning it. After pushing a little bit more, I could feel London’s head come out! It felt like a subtle “pop” but without any pain. Apparently, her heart rate started to drop, so they asked if I could push again to get her out. I was like, “Sure!” I wasn’t breaking a sweat at all! I reached down and grabbed my beautiful daughter and pulled her to my chest. She was squirming, and the baby nurse was right there clearing out her mouth and nose and checking her. I loved how everything happened right there on my chest. London began crying, and she was perfect. “I’m not pregnant anymore!! !” I exclaimed! The nurses and midwife laughed and said, Apparently no other mom has ever said that after having a baby! I was praising Jesus over and over again for a safe delivery and a healthy baby. He is so, so good. Thank you for following our story if you made it this far! We are so excited to see how God grows our little family!